£54.99 in argos with £5 off using argos birthday club code. been thinking of getting youngest a innotab or tablet. 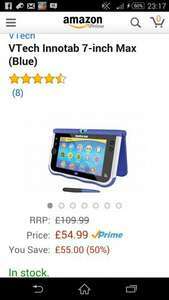 can you suggest a child proof tablet alternatively around the same price? been thinking of getting youngest a innotab or tablet. can you suggest a … been thinking of getting youngest a innotab or tablet. can you suggest a child proof tablet alternatively around the same price? comment was regarding posters original spelling (inner tab) rather than innotab! If it helps, we have a Leappad and an Innotab....out of the 2 the Leappad gets used more. comment was regarding posters original spelling (inner tab) rather than … comment was regarding posters original spelling (inner tab) rather than innotab!If it helps, we have a Leappad and an Innotab....out of the 2 the Leappad gets used more. thanks for clarification, viewing on app could not see it had been edited. do you find the cost of games less on leappad v innotab? can they be shared across two devices? thanks for your suggestion, will have a look. presume if android can get googleplay or Amazon version for games. Had a look at kidzone to lock down what they can do too. thanks for your suggestion, will have a look. presume if android can get … thanks for your suggestion, will have a look. presume if android can get googleplay or Amazon version for games.Had a look at kidzone to lock down what they can do too. there were some great deals on the Nabi 2 a while back through Argos eBay outlet. worth a wee search on here. thanks for clarification, viewing on app could not see it had been … thanks for clarification, viewing on app could not see it had been edited.do you find the cost of games less on leappad v innotab? can they be shared across two devices? there were some great deals on the Nabi 2 a while back through Argos eBay … there were some great deals on the Nabi 2 a while back through Argos eBay outlet. worth a wee search on here. Deal posting newbie! This is rieswans first deal post. Help out by leaving a posting tip or just to show your appreciation for their contribution.